Intel’s Core i3, Core i5 and Core i7 CPUs have been the staple processors of PC gaming for absolutely yonks – and they don’t show any signs of going away, either. Right now, we’re on the 8th and 9th generation of Intel Core CPUs, which are collectively known under the umbrella term of ‘Coffee Lake’. It’s been a while since I’ve updated this guide, so here’s a fresh look at everything you need to know about Intel’s current crop of desktop CPUs, including all the different model names, specs and prices, what separates a Coffee Lake from a Kaby Lake/Skylake/Ice Lake and all other manner of ‘lakes’, which motherboard you need for an Intel Core CPU, as well as what’s coming next from the world of Intel. Intel Coffee Lake: what is it? Coffee Lake is the manufacturing code name given to all of Intel’s 8th and 9th generation processors. This includes their most recognisable Core brand, as well as their entry-level Pentium and Celeron processors. The latter two tend to only be found in very basic systems that aren’t kitted out for gaming, so for the remainder of this article, I’ll be concentrating on Intel’s Coffee Lake Core processors. The easiest way to find out if a Core CPU is a Coffee Lake one is to have a look at its model number. If it’s part of Intel’s 8000 or 9000 family – for example, the Intel Core i5-8400 or Intel Core i7-9700K – then you’re in Coffee Lake territory. Coffee Lake CPUs all use a 14 nanometer (nm) manufacturing process. This refers to the size of a processor’s individual transistors. The smaller they are, the more you can cram onto a single piece of silicon, resulting in better performance than chips with larger, and thus fewer, transistors packed into the same surface area. Technically, Intel are a bit behind the curve here, as AMD have already jumped to using a 12nm process for their latest Ryzen CPUs. Intel, on the other hand, have chosen to stick with the same 14nm manufacturing process as its last three generations of processor for Coffee Lake, albeit using a process that’s greatly ‘improved’ and more efficient than their previous 14nm Broadwell, Skylake and Kaby Lake chips. To use the official parlance, it’s technically called 14nm++. The most important thing about Coffee Lake, however, isn’t the number of transistors it has – it’s the number of cores that come with each CPU. Whereas previous Core i3 processors only ever had two cores at their disposal, Coffee Lake Core i3 CPUs now come with four. Intel’s Core i5 and Core i7 branches also got a boost, going from four cores to six, while their very first Core i9 CPUs have eight. The end result is a massive increase in performance across the board – particularly at the lower end of Intel’s Core family – without too much of a massive increase in price, making them more competitive in the face of AMD’s exceedingly good value Ryzen CPUs. Just like previous generations of Intel processor, desktop Coffee Lake CPUs are split into three main brackets: Core i3, Core i5 and Core i7. Core i3 CPUs are generally targeted toward lower-end budget PCs, Core i5s are generally a good shout for mid-range machines, while Core i7s are proper high-performance powerhouses. Intel’s also recently introduced an even more powerful family of Core i9 Coffee Lake processors, too. Previously, Core i9 processors were intended for professional-grade workstations – not the likes of consumer PCs, but this all changed with the introduction of the Core i9-9990K. There’s still only one of them available at the moment, but there are bound to be more joining the Core i9 ranks in the months to come. You may also come across some with a + sign in front of them, too, such as the Intel Core i7+ 8700. This means the processor has Intel’s super-duper Optane Memory on board for even faster speeds and lower latency. Here’s a list of them all in handy table form, with the top CPU in each Core category listed at the top. What motherboard do I need for Coffee Lake CPUs? Although Coffee Lake CPUs physically fit into the same LGA 1151 motherboard sockets as Skylake and Kaby Lake chips, you sadly can’t just bung your shiny new Coffee Lake chip into any old LGA 1151 board: chances are it won’t work. Instead, you need to make sure you get one with a 300-series chipset in it. 100- and 200-series chipsets are for Skylake and Kaby Lake processors only. Naturally, cheaper 300-series motherboards are generally better companions for lower-end Coffee Lake chips, while more expensive motherboards will let you get the best out of your Core i7s and overclockable Core i5s. 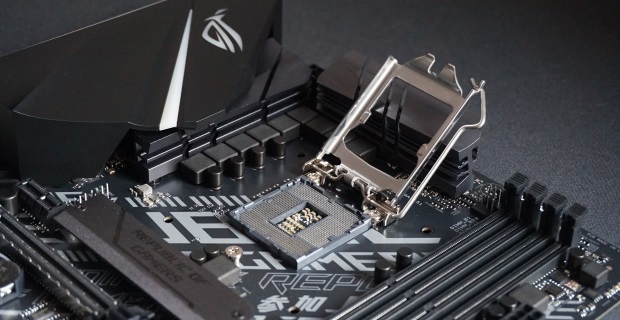 The Z390 chipset was also released alongside Intel’s Core i9 CPUs to help users get the best out of their super fast processors. What’s with all the lakes? How is Coffee Lake different to Kaby Lake and Skylake? Intel’s had a thing about watery naming conventions ever since the beginning of the 2010s. Before they started on their ‘Lake’ theme, we had a pair of ‘bridges’ in the form of 2011’s Sandy Bridge and 2012’s Ivy Bridge, before moving onto some ‘wells’ with Haswell and Broadwell. Then came Skylake, which came to be known as Intel’s 6th generation of desktop CPUs. These chips also used the 14nm manufacturing process, and had model names such as Core i5-6600K and Core i7-6700. However, Skylake is also the name of the underlying microarchitecture used by Intel’s 7th generation of desktop processors, Kaby Lake (Core i5-7350K and Core i7-7600K, etc), and even the current 8th Gen, Coffee Lake. It’s also set to form the basis of Intel’s next set of processors, which are currently codenamed Ice Lake. So technically, we’ve been using ‘Skylake’ chips for the last three years. That’s largely down to Intel ditching their so-called ‘tick-tock’ upgrade model of yore, where a ‘tick’ year represented a shrinking of nanometers, and a ‘tock’ year introduced a new micro-architecture. Indeed, the last ‘tock’ was that initial introduction of Skylake. Now, we’re supposed to be in a ‘process, architecture, optimization’ model, but all we’ve had are optimizations because the next process (or nanometer shrinking) ended up getting delayed. Indeed, we’ve now had another optimisation refresh in the form of Intel’s 9th Gen of Coffee Lake CPUs. These were built to mitigate against the Meltdown and Spectre security vulnerabilities that were blown open at the beginning of 2018. However, at CES 2019, Intel finally confirmed that their new Ice Lake processors would finally be here by the end of 2019. Sort of. So where does Ice Lake fit in? Ice Lake will finally move Intel’s CPUs onto the long-awaited 10nm manufacturing process, and it’s coming sometime in Holiday 2019. Ice Lake will also be running Intel’s new Sunny Cove architecture, which promises to deliver big improvements in AI computations and machine learning over the existing Skylake micro-architecture, and most importantly carry on Intel’s watery naming conventions. At the moment, though, Ice Lake is only slated to arrive on laptops by the end of 2019, so we may well have to wait until the latter part of 2020 before we see the desktop versions start to arrive. As of yet, there’s no confirmation about the kind of prices we can expect to see, or what kind of specs they’ll have. Still, the features Intel have talked about so far certainly sound promising for laptops. With the power efficiency boosts that come with moving to 10nm, this means massively improved battery life – more than 24 hours, Intel told Digital Trends – and laptops with much thinner chassis, all without the usual compromises on performance. Ice Lake will also have built-in support for Thunderbolt 3, allowing for data transfer speeds of up to 40Gbps, plus Wi-Fi 6 (or 802.11ax) for the highest wireless internet speeds. A lot of routers don’t actually support this yet, but at least Intel’s new processors will be ready for when they do. And finally, they’ll have all the right protection, i.e: proper hardware fixes, against the Spectre and Meltdown flaws mentioned above. Check back regularly for more updates as and when they’re announced.